WOODLAND - The final arguments in the case against volunteer Esparto firefighter Robert Eason, who was arrested for starting fires between 2005-2006 in the Capay Valley, were heard today. 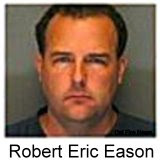 Yolo County Prosecutor Garrett Hamilton said Eason was caught in a triangle of evidence at the Yolo County Courthouse. A GPS device tracked Eason driving by every spot a roadside fire he is accused of starting occurred. Hamilton noted that in the 64 days Eason was tracked there wasn't a fire he didn't drive by. Mosquito coils, which were allegedly used to create the time delayed incendiary devices, were found at his home despite the fact Eason said he didn't own any. Match books, fishing line and mosquito coils were also found in his car. Hamilton also said that no ignition sources were found at the fire scene, which suggested mosquito coils were used. "Robert Eason had a darker side, that darker side is Eason as a wild man arsonist," Hamilton said. Eason's defense attorney Rodney Beede said other evidence wasn't taken into consideration. He said experts at some of the fires reported finding a firecracker, iron and ash but did not do further tests to pinpoint what the cause. With GPS trackers, investigators following Eason and people positioned at places of potential fires, Beede said no one saw Eason start fires. "The sum total of what they got was zero," Beede said. Beede said the prosecution was using circumstantial evidence to prove Eason guilty. "I thought in America they had to prove guilt, not we had to prove innocence," Beede said. Jury members have began final deliberations. WOODLAND, Calif. -- A volunteer firefighter accused of setting a string of fires in Yolo County last month may be responsible for as many as 143 blazes over several years, authorities said. Robert Eric Eason, 37, of Guinda was arrested and charged with 12 felony counts of arson and a dozen counts of using an incendiary time-delay device. Eason has been been a volunteer the Capay Fire Protection District since 1988, and investigators are looking at evidence connected to fires dating back to 1988 to determine if Eason will face additional charges. "It's just sickening to us," said Tina Rose of the California Department of Forestry and Fire Protection. "It's a disgrace. We don't want that reflecting upon all the good firefighters. "Investigators said Eason is suspected in a 1,000-acre wildland fire during high winds in Sept. 22 near Zamora that threatened numerous structures and killed a number of sheep on ranches in the area. Anyone with additional information about this case is urged to call the CDF Arson Hotline at 800-468-4408.